Mitsukoshi postcard featuring the art exhibition floor of its store, 1910. 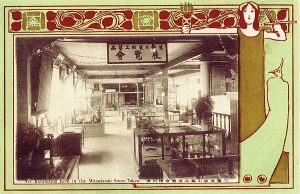 In 1907, the Mitsukoshi department store established its art section to display and sell the art of prominent contemporary artists. Following Mitsukoshi’s lead, a number of other Japanese department stores opened art sections one after another. The stores claimed that they would contribute the cultural cultivation and refinement of the nation by providing expanded opportunities for all Japanese to collect and appreciate the arts. Despite open access to art sections of department stores, however, their primary customer was the rising urban middle class, who purchased art for the interior decoration of their new homes. 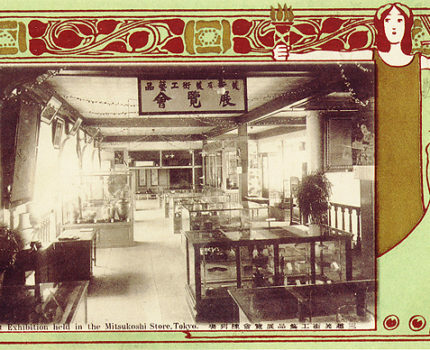 Japanese department stores became major art entrepreneurs in the first quarter of the twentieth century. Their promotion of “the tasteful consumption of art” played a crucial role in the articulation of social distinctions and contributed to the formation of class identity for the new middle class. In the process, department stores capitalized on the cultural aspiration of their upwardly mobile customers. Younjung Oh is a Robert and Lisa Sainsbury Fellow at the Sainsbury Institute for the Study of Japanese Arts and Cultures. She received her BA from the Seoul National University and PhD from the University of Southern California. Her research interest is in the historical construction of “fine art” as a modern institution. She considers this question in relation to what the modern institution of art has attempted to efface in its history. Her doctoral dissertation examined the artistic practices of Japanese department stores, which have been overlooked in the discourse of modern Japanese art history despite their profound influence on the praxis of modern Japanese art history.